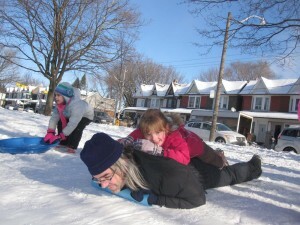 Tobogganing with my daughter (I got to go four times, and I got to be the toboggan on a couple of runs). Catch up with Software Carpentry email. Take my Australian visitors out for dinner (this will be a lot easier than #1). Put together a five-minute talk explaining why a tool to merge PowerPoint slide decks is a key enabler of a better-than-MOOCs future for education. Finish reading The Last Policeman. "How to Cut a Pizza"
"The Cambist and Lord Iron"
"Data Sharing and Management Snafu in Three Short Acts"
"America's Real Criminal Element: Lead"